The Hurricanes are perching at the top of the points table in this BBL. The four-match Test series between Australia and India has been a witness to some impressive cricket. However, the matches have also seen some on-field banters between the players. Even as Tim Paine and Virat Kohli hogged the limelight in the second Test in Perth, Paine and Indian cricketer Rishabh Pant was in the centre of a few hilarious conversations in the third and penultimate Test at the iconic MCG. Their words were caught in the stump microphones. During India’s first innings when Pant came to bat, Paine called him a ‘babysitter’ from behind the stumps. Pant had his chance when Paine came to bat during Australia’s run-chase. The Indian wicketkeeper-batsman called Paine a ‘temporary captain’. The interactions weren’t brutal by any stretch of the imagination and rather they spiced up the encounter. 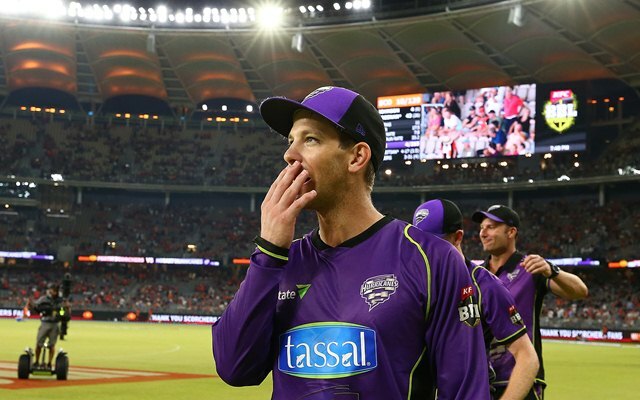 Hobart Hurricanes have had an impressive time in this BBL. The team, captained by wicketkeeper Matthew Wade, are placed at the top of the points table with victories in all their four matches. They brushed aside Brisbane Heat by 15 runs in their opening contest at Carrara Oval in Queensland. Thereafter, they got the better of the Melbourne Stars in Hobart. The Hurricanes went on to beat Sydney Thunder as well. Their last victory by six wickets came against Adelaide Strikers at the Aurora Stadium. Fast bowler Riley Meredith turned out to be the Player of the Match with an impressive three-wicket haul.